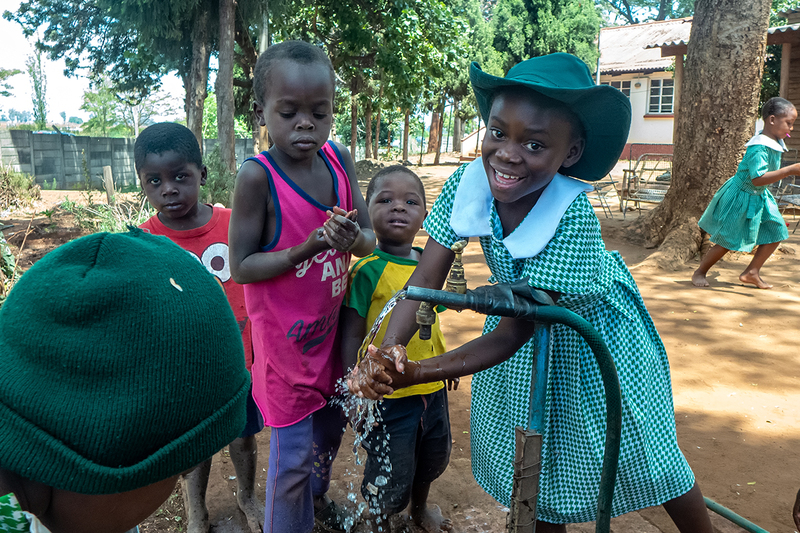 HARARE, ZIMBABWE — A young girl in a checkered school uniform hurries toward a wooden shed, her bookbag hanging open. More students excitedly follow her. 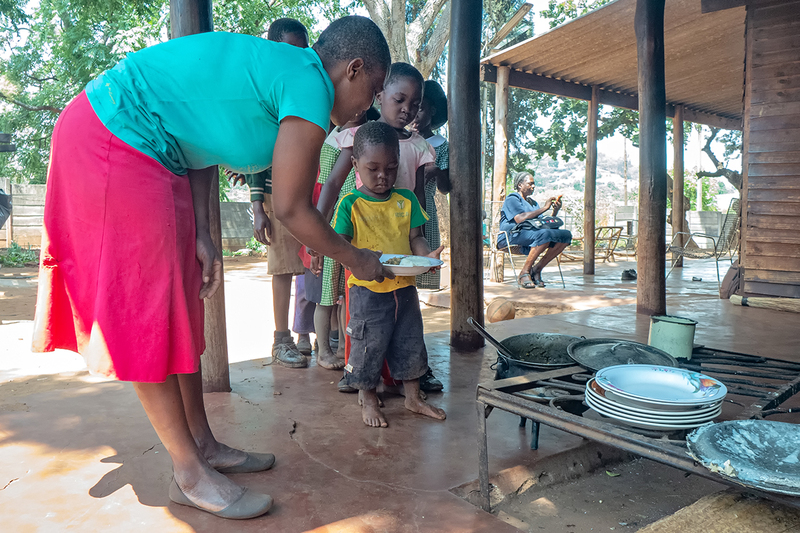 They’re looking forward to digging into a plate of hot food at Faith Community Support Trust, a popular drop-in center that provides free meals to children in Kambuzuma, a neighborhood in the capital city of Harare. Most families here are lucky to get more than one hot meal a day, says Orpah Magadzire, caretaker at the center. More than 120 children eat at the center every day. Zimbabwe’s economic collapse has left many people unable to afford basic cooking ingredients. Cooking oil, for example, was $3.85 four months ago. Now, it can cost nearly $10. Nonprofits and social service organizations are battling the country’s broken economy, too. This drop-in center and others in the area are just what some students need, but it’s not certain that they’ll stay open, Magadzire says. The number of children coming to drop-in centers is growing, but funds are running low. Experts in the region say children have been among the hardest hit by the financial crisis, which has lasted since the early 2000s. Though they’ve improved in recent years, rates for wasting, which occurs when a child’s body weight is low for their height, increased sevenfold between 1988 and 2005, according to 2012 University of Zimbabwe research. Child malnutrition is still a challenge. UNICEF data from 2016 indicates that 33,000 Zimbabwean children have severe acute malnutrition. With few signs of the economy recovering and food insecurity growing, Magadzire set up the drop-in center in 2006 to support the youngest residents of her community. Eighty-four children are registered with the center to receive daily food aid, Magadzire says. But on any given day, the center receives no fewer than five walk-ins. Magadzire runs the center with both monetary and food donations from local donors, philanthropists in Germany and National Foods Limited, one of the largest food manufacturers in the country. But when these donors cut down on their giving eight months ago, Magadzire says the center went through a rough patch. Each month since the center opened, National Foods Limited had donated 300 kilograms (661 pounds) of maize meal, a maize flour which is used to make sadza, a Zimbabwean staple. Now, they give 180 kilograms (397 pounds) of maize meal along with 5 kilograms (11 pounds) of salt, Magadzire says. “They say that is what they can do at this point in time because of the economy,” she explains. But the children haven’t stopped coming. Most are referred by teachers from schools in the area. Wadzanai Primary School is one of them. The vice principal, Calister Matsitsiro, says her students are in dire need of food aid. “We are living in desperate times, as you know. We need aid in any form to be able to feed the kids,” Matsitsiro says, adding that the school used to provide lunch, but the portions were very small and could hardly sustain the children. “These children would have either collapsed from hunger at school or they have been identified as suffering from malnutrition,” Magadzire says. Turning walk-ins away is not an option for Magadzire, so she says she’s made some changes at the center. The facility used to offer a variety of meal options. Now, staff at the center provide bean and vegetable dishes only. Magadzire says she buys ingredients in bulk and stretches it out over a month. She also solicits funds from churches. The task of providing for her visitors is made even harder because some take food home to family members who haven’t had anything to eat that day, Magadzire says. Magadzire isn’t the only one tasked with managing a drop-in center in Kambuzuma. Catherine Tinkenawo runs Trust Lord Orphan Care, which gives food aid and tuition assistance to children in the neighborhood. Tinkenawo faces similar challenges. Every day, the facility caters for 82 children, yet more children need to be fed, she says. Trust Lord Orphan Care gets most of its money from donors in Germany. Seed Co Zimbabwe, a seed and crop supplier, donates maize. But Tinkenawo says donor giving has been inconsistent. “Things are tough, but we thank God for the well-wishers who help us as we go along,” Tinkenawo says of one-time givers. 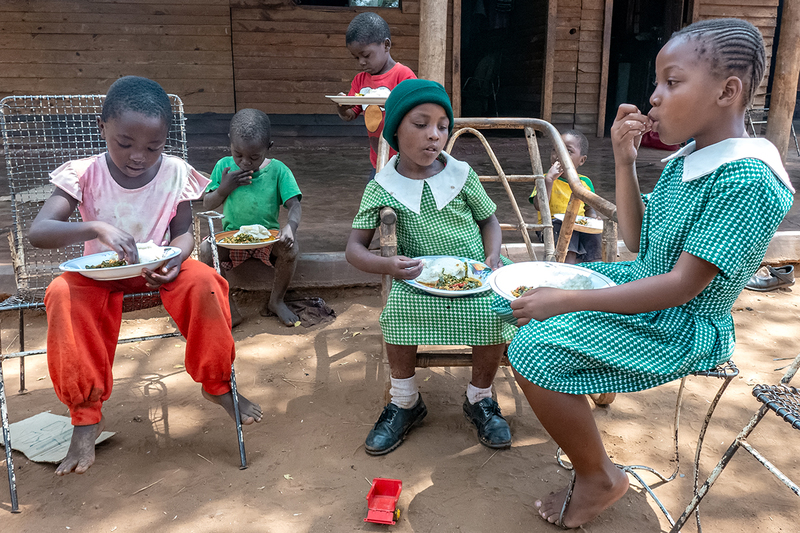 Even though it hasn’t been easy for Tinkenawo to feed children in her neighborhood, like Magadzire, she says she has no intention of closing her doors. As Magadzire walks out the entrance of the center to see guests off, the children follow her with their eyes. “Where are you going?” one kid shouts and waits in silence for her response. “I’m running away,” Magadzire jokes. “No, you won’t. You will be here tomorrow,” another child yells back, and they all laugh. Kudzai Mazvarirwofa, GPJ, translated some interviews from Shona. Tags: economy, food, Global Press News Service, youth, Zimbabwe.